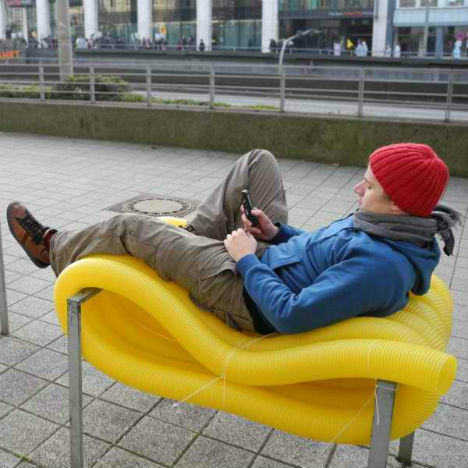 Just try to locate a truly comfortable outdoor, public place to lounge around your city. 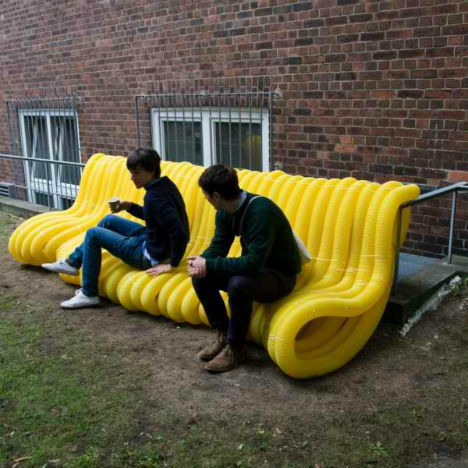 Typically what you’ll find are rigid benches that discourage people from lingering too long. 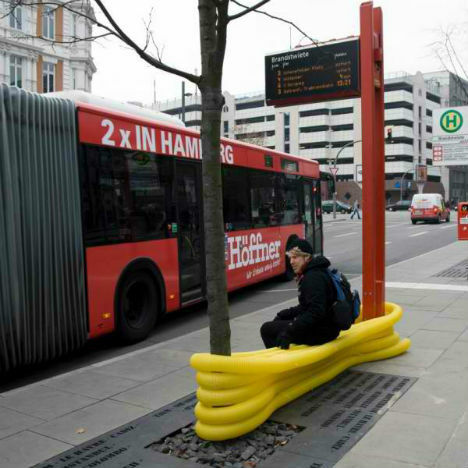 Artist Oliver Show sought to remedy that in Hamburg, Germany, by creating bold yellow benches, couches and other seating areas in unexpected places. 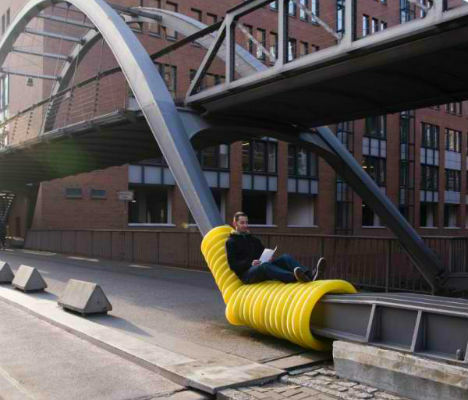 The sculptural, flexible seating areas are created by wrapping yellow drainage pipes around the city’s existing infrastructure including bridge trusses, bike racks, handrails and trees. The material is low-cost and weather-resistant, and its bright color enables it to stand out among the largely neutral hues of its surroundings. “The interventionist and experimental approach to me is more important than the quest for a ‘perfect’ product,” the artist told Der Spiegel (via Architzer). The installation won Show a design award from the HFBK Leinemann Foundation for Education and the Arts. When urban spaces are designed to prevent people from getting too comfortable – a problem that could be partially solved by coming up with some creative solutions for homeless housing – they perpetuate a cycle of constant motion that keeps city residents from pausing to notice, enjoy and interact with their surroundings. If only urban planners would take more cues from artists, and from the very people who use the infrastructure they design.